When it comes to choosing gifts for the holidays I like to gift personalized gifts over something generic you can get at the store. One of my favorite places to shop for unique personalized gifts is Minted.com. They have a variety of gifts to choose from and they are super easy to use when it comes to creating personalized designs. 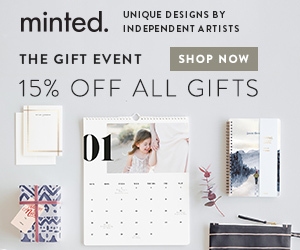 If you are looking for something special to gift this holiday season check out our favorite top five gifts from minted.com. Minted.com has a huge variety of cards for every occasion but their holiday cards are always my favorite. If you want to send a special card to your loved ones this year check out their awesome designs. Super easy to create on their site. Simply add your favorite photos and personalized text. Before you know it your cards will arrive and you can jot down a quick note and ship them off to all of your family. They will love the personalized touch and it’s always so nice to get an actual card in the mail these days. When it comes to getting gifts for parents and grandparents I love giving them photos of the family and especially the kids. It seems like we collect so many photos throughout the year and what better way to present those photos than a personalized calendar. You can add photos to each page so your loved ones can enjoy new photos each month. It’s a great gift idea that will be cherished for years to come. I am in love with Minted.com’s photo collages. These beautiful designs make great gift ideas for anyone you might be shopping for this year. They have a variety of designs to choose from even some for special occasions like graduation, wedding, and more. Super easy to design, simply add your photos, change any text that might be on the photo, and choose a frame. I love that they come framed and ready for gifting as well, a super easy and simple gift. Beautiful gift idea for loved ones. Do you like to write letters? I know not many do these days but if you do or you know someone who does personalized stationery is a great gift idea. They have a variety of designs to choose from so you can find the style that best suits your style. Add your name to give it that personalized touch. It’s a super cool gift idea for the writers in your life. As a writer, I use a lot of notebooks so I love gifting notebooks and journals. Why not make them personalized with the beautiful designs from Minted.com? They have a bunch to choose from so you can find the perfect one. I love the photo option so you can add some super cute photos of your loved ones and make it extra special. They allow you to choose from a regular journal, address book, monthly calendar, or weekly calendar. Great gift idea for a writer or anyone who likes to keep things organized. These are only a few of the great gifts available at Minted.com this holiday season. If you are looking for a unique gift idea for your friends and family make sure to check out all the great options they have available today! I’d like all of these products, especially the notebooks! They have really nice products and they personalize them nicely. I can think of a few things I would love to have from there.